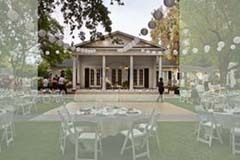 While exploring potential wedding venues to host your forthcoming wedding, you’ll definitely find that there is a large selection of exceptional wedding and reception sites throughout California, each of which possess varied highlights and attractions that promote an atmosphere of excellence and the promise of delivering a day you’ll always remember. 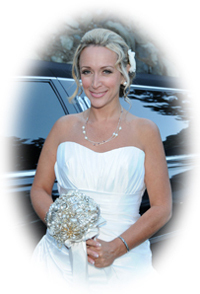 Though your possibilities are virtually limitless, you may want to slightly refine your search by beginning your pursuit with three highly recommended and unique venues found in Northern California that are categorically rated among the finest. Built in the 1940’s, this prevailing wedding site hosts over 200 weddings a year. The edifice, built of rock and timber with an Old English architectural style façade, is located in the rolling hills of Tilden Park in Berkeley, California. Beautifully situated, this imposing place with its rustic charm, set amidst a light fragrant mixture of oak, pine, and eucalyptus trees, offers incomparable amenities that will impress the most captious critic. Consummate features of the Brazilian Room include floor-to-ceiling windows on both sides of the hall that provide scenic views of green meadows and trees, striking vaulted ceilings with wooden rafters, a commercial quality kitchen consisting of a 12 burner stove and commercial-sized refrigerator, wooden floors, and a brick fireplace. Additionally, the momentous room features the original interior hardwood paneling obtained from the Brazilian Pavilion, which was designed by Gardner Dailey for the Golden Gate International Exposition in 1939 and given to the park as a gift. The exposition, held in San Francisco on California’s Treasure Island, was a World’s Fair that celebrated the city’s two newly-built bridges – the Oakland and San Francisco Bay Bridge. The hall’s seating capacity varies dependent upon if a dance floor is included. The room seats 120 guests with the dance floor and 150 without the option. A ceremony on the facility’s flagstone patio allows for a larger capacity, comfortably seating 180 guests. Provided are table rounds or rectangles, padded chairs, and Green Market Umbrellas for an outdoor ceremony. 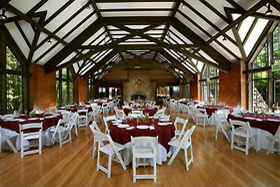 Operated by the East Bay Regional Park District Rental Facilities Office, the Brazilian room is ideal for large, formal weddings. With a mixture of architecture of both historic and modern, this refined wedding and reception venue is one of Redding’s best. The White House is located in Shasta County on Churn Creek Golf Course and is an exceptional place to celebrate any special event or occasion. The design of the home was based on a sketch created by Thomas divine around 1852 and was a wedding present for his fiancé. 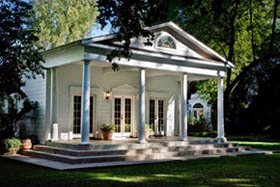 Stephen and Deborah Divine later renovated the house for their own wedding that took place in 1992. The setting of the home is brilliant and encompasses towering trees, colorful gardens, a Federal Revivalist style portico, scenic pathways, and dramatic night lighting that line the landscape. 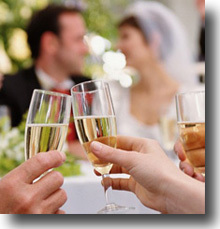 The facility is loaded with additional amenities that will positively make an impact upon the bride and groom, which includes a bridal suite with a master bath and Jacuzzi, a guest house for the groom and his party, tables and chairs providing seating for up to 200 guests, a dance floor, and a fully functional kitchen with a large refrigerator and prep counters. An exceptional wedding venue that’s able to accommodate large parties and appropriate for formal or informal attire, the White House is an attainable option to host your special day. Nestled at elevated heights in the Sierra Nevada Mountain Range overlooking Lake Tahoe is one of the most beautiful spots in the world. Located on the west side of the lake approximately 20 miles from the state line of Nevada, Emerald Bay is a renowned tourist attraction and is also a very prevalent destination wedding venue. If its simplicity you seek on your wedding day, the bluff over the bay is a great site that offers a setting that parallels the best available, yet eliminates much of the wedding planning process associated with many indoor facilities. 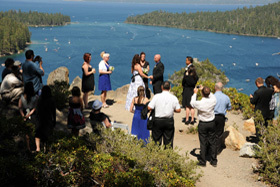 An Emerald Bay wedding is ideal for those desiring an uncomplicated, outdoor wedding in the center of nature. The surroundings are inspiring, emitting a tranquil and intimate ambiance. The secluded area where the ceremony occurs is at the edge of a bluff nearly 300 feet above the striking, tri-colored bay, and the panoramic view of the lake and encompassing Sierras present a panorama that is indescribable with words. Although Emerald Bay places limitations on the number of guests who can attend and is only available for ceremonies, it remains a perfect place to marry, most particularly when extensive planning is not desirable or financial confines reduce available options. With an array of outstanding wedding locations from which to choose, brides and grooms are certain to find the precise way of how and where they want to celebrate a very prominent day in their lives. The Brazilian Room, the White House, and Emerald Bay are only a few unique locations that Northern California has to offer, but with such exceptional attributes and enrichments each sustains, these opulent venues may perhaps have the merit you’re looking for.